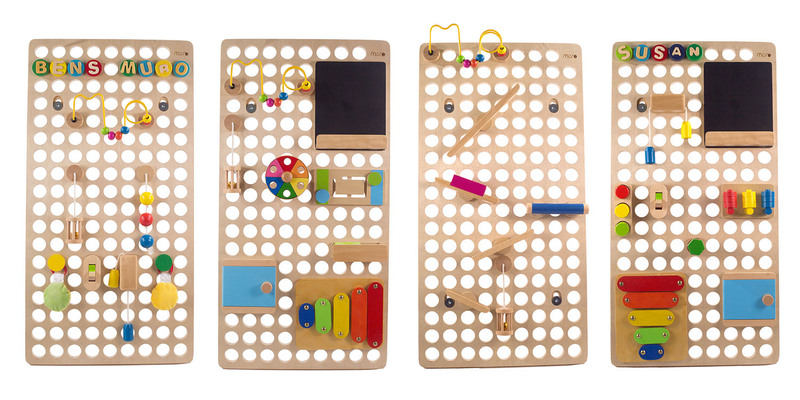 Muro is a busy board (activity board) for your kids that uses a circular grid-patterned board and plug-and-play accessories. 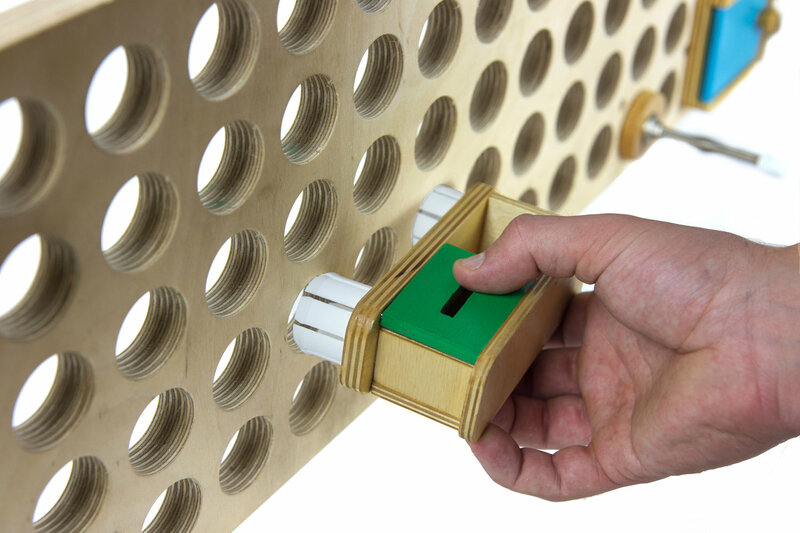 Muro makes it easy to create a unique play based educational toy any where in your house. 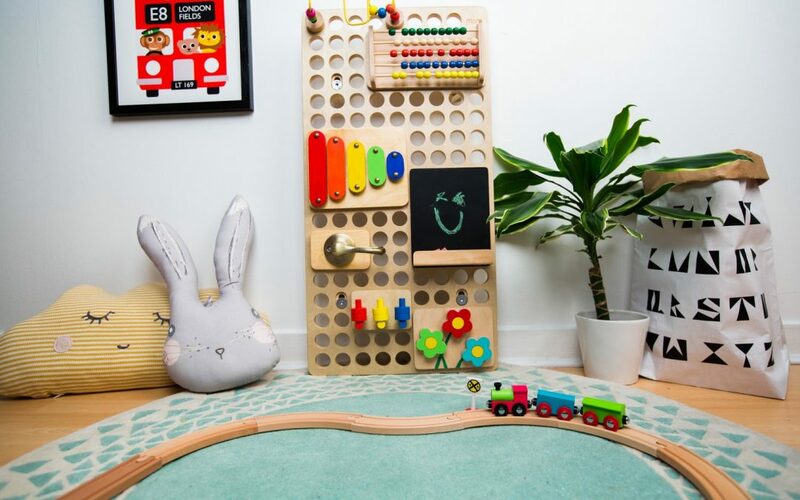 Once the board is up, you simply move and swap accessories, keeping it interesting and encouraging your child’s development. 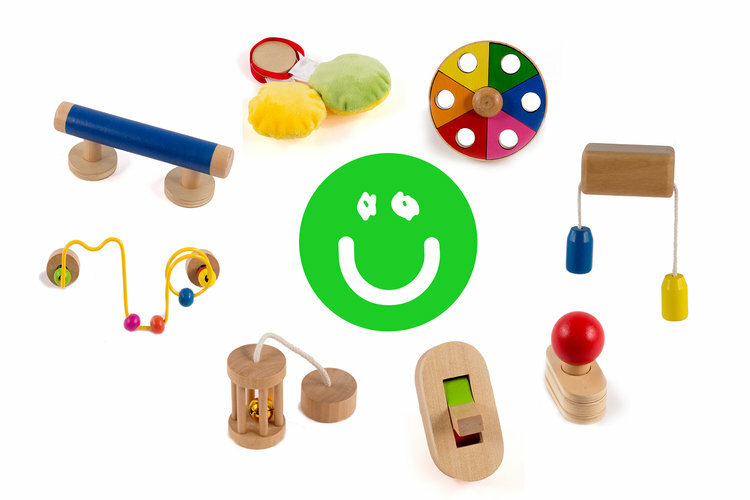 KidKATAT is always looking for new products that will help you and your family’s quality of life. The moment we saw the Muro, we loved it and we know you will, too! Check out the interview below with founder, Jeremy Bond to get know the product and the people behind it. The first version of Muro was built in 2013, we’ve been working on it quietly for the last 3 years but has been my main focus for the last 6 months. Who is involved with the company? Tim and I are brothers so we’re very much a family company. Tim’s an engineer in Houston and built the original busy board which sparked the inspiration, and we’ve developed the product together since then. Tim and I still discuss product changes but I’m taking the lead from a business point of view. What were you doing for work prior to creating Muro? I’ve worked in sales for a number of orthopedic companies, most recently a pediatric company. It was always just a job and I’m glad to be leaving at the end of March. Tim and Ben were the inspiration. Once we saw how much Ben loved his Muro we wanted to be able to share that. 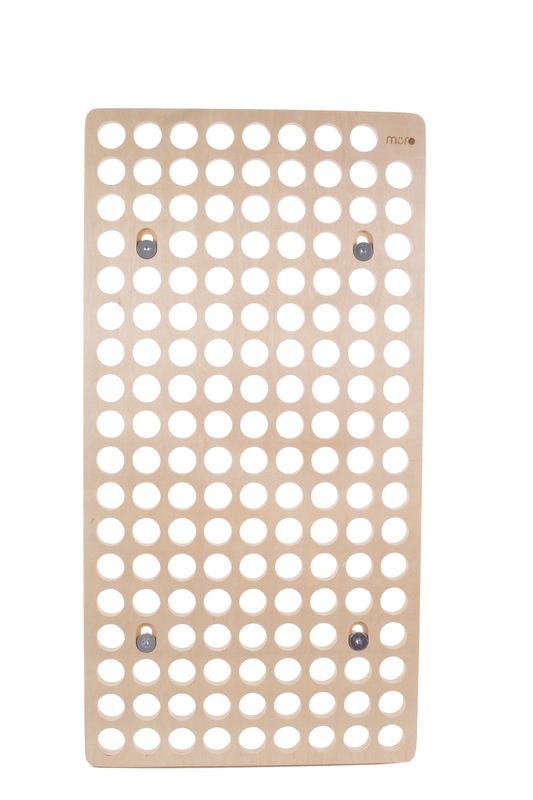 The big break through came when we realized the user should decide what they put on the board, so we designed the MURO to empower people to create their own busy boards. Did you go through a lot of design iterations or did you know how it was going to look from the start? Yes and no. The circular grid concept came very quickly in the design process and has remained the same whilst the board has changed size and shape slightly to get to where we are now. The hardest part was getting the connecting plug right, there were over 20 different versions before we found the one with theft we wanted. What is your favorite Muro accessory? Ah, it’s like choosing between your children! There’s certainly some which were more challenging than others, but I do particularly like one of the latest ones which was inspired by prayer wheels. The wood looks great and I think it encapsulates MURO. Simple, crisp and fun. How have people been reacting to Muro? So far we’ve had an incredible response, everyone’s very nice about it, until I tell them it won’t be available for a few months. What has been your favorite part of working with Muro? There have been so many; I’ve learnt a huge new range of skills, I’m excited to go to work in the morning and seeing kids and parents react to MURO has been a real highlight. What is the future of the company? How do you see yourself growing in the next 5 years? Very bright at the moment, the beauty of MURO is that it’s an open platform and the possibilities are literally endless. Currently we’ve got 40 MODS designed and ready to go, but have focused on the 9 month – 4 year old age groups. The ambition over the next few years to increase this to hundreds and to develop ranges to allow kids to use MURO platform for their creativity and open play, that will keep older kids interested too. We’ve also had questions from teachers working with disabilities, this is something I’d love to develop a specialized range of MODS for. Since it is wall mounted, we love that it takes a minimal amount of space. Great for those with small spaces and those who don’t want to clutter their spaces. 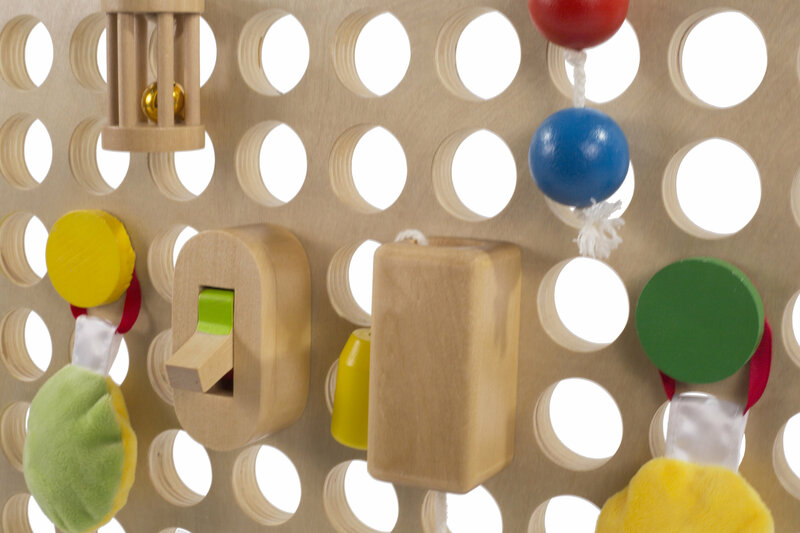 The beauty behind the Muro is that it is completely modular! The user can customize their own unit according to their child’s age and interests. This means that Muro will grow with your kids! Since it’s modular, components can be bought separately and configured exactly how you like it. The possibilities are endless! We talked with Jeremy about the Muro accessories. There are already 40 accessories ready to go! 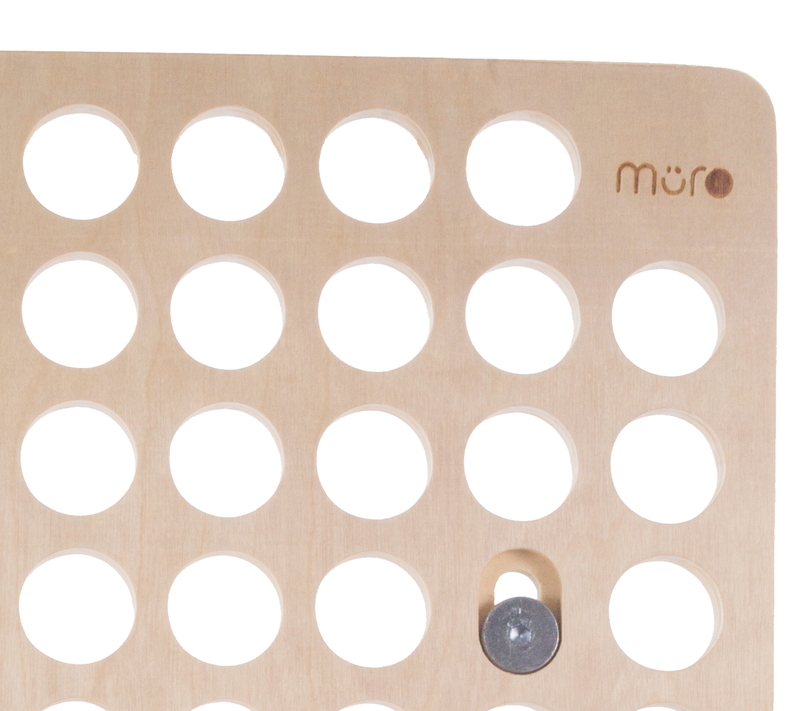 Muro worked very hard to make their products from materials like wood and kept the use of plastic to an absolute minimum. We know how hard that is to do and appreciate the makers behind Muro to take the extra effort. 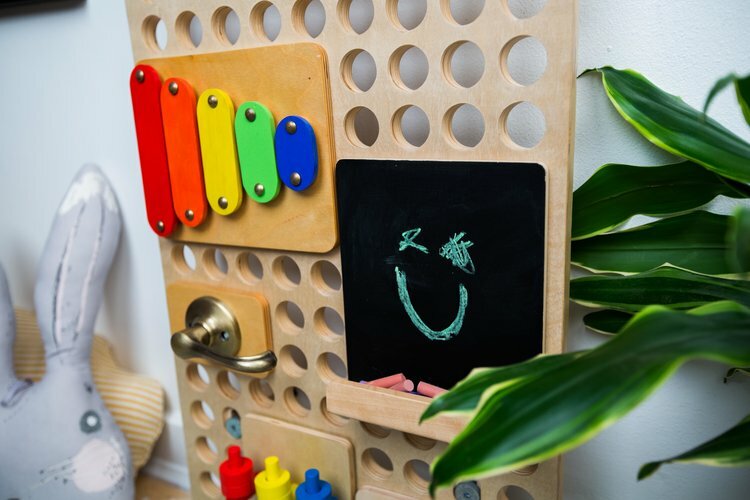 Overall, Muro will not only look amazing in your space but it will foster creativity, development and fun for you and your kids! What’s not to like about this product? Where do I get my very own MURO? You’ve read and watched the videos and you only have one more question … Where can I get one?? Muro launches on Kickstarter April 5th! Be one of the first to enjoy this amazing invention. Below is a peek at Muro’s kickstarter video. You can keep up to date with Muro at their official website. Also be sure to sign up for KIDKATAT’s mailer (above the header!) for possible news on how you can win your very own Muro and other products. Kickstarter price for MURO with Starter Pack (6 toys) will be £99 (-£15 for early bird) with worldwide shipping available. Full retail will be £140.